Oats (Avena sativa) is a member of the grass family. The glumes are large and completely enclose the spikelet. They continue to enclose the grain after threshing. Naked oats, a hulless variety, in contrast threshes free from the husks. Compared to other grains oats contain more soluble fibre of which one type are beta-glucans, which have proven to help lower cholesterol. 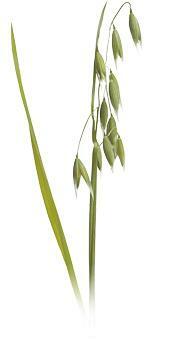 Oats probably persisted as a weed like plant in other cereals for centuries prior to being cultivated by itsself. Our present cultivated oats are a crossing of different wild varieties and appeared relatively late in Central Europe (1,000 B. C.). Oats are chiefly a European and North American crop. These areas have the cool, moist climate to which oats are best adapted. The Russian Federation (5,407,000 MT) and Canada are the leading oat producing countries followed by Poland, the USA, Spain and Finland (2007). Several breakfast cereals and bread products are made from oat flour and rolled oat products. Also biscuits, baby food and porridge are often based on oats. Furthermore one of the common uses of oats is livestock feed.